This was originally published on Monday, June 18, 2018, in the Pacific Daily News. Click here to subscribe to the PDN. During the summer months, the temperature seems to be much warmer. With the kids home from school and utility bills on the rise, you may be in need of making some changes to help you save money on utilities. Fans. This is a wonderful way to circulate air and keep the room cooler. Ceiling fans can cool the warm air that rises to the top of a room. They also use less energy than an air conditioner. Window treatments. Blinds and curtains are an inexpensive way to keep direct sunlight from warming a room. If you are willing to pay a little more, look for curtains that block out sunlight and harmful UV rays, which also can discolor furniture. Air conditioners. Keep your air conditioner to the highest temperature that you feel is comfortable. When you are not home, turn it off. You should clean your air conditioner filters at least once a month. Have a professional technician clean your unit at least once a year to certify it is running properly. If you are in the market for a new unit, do your research on the unit’s SEER (seasonal energy efficiency ratio), which measures the ratio of cooling capacity to power input. The higher the rating, the more efficient it is. The SEER will vary by manufacturer and size. Ask your installation company for a rebate that you can use as credit toward your power bill. Light bulbs. Traditional light bulbs create heat and burn more power. Look into replacing them with compact florescent or light-emitting diode bulbs. A 13-watt CLF or 9-watt LED bulb will burn 25 percent less energy than a 60-watt traditional bulb. Using natural light will reduce how much power you consume. Remember to turn off lights when you’re not in the room. Turn it off. Devices such as computers, TVs and gaming consoles eat up power. They also generate heat. Remind kids to turn them off when not in use. Laundry. Wash only full loads of clothing and at the coldest recommended temperature. Hang clothes to dry. Just before they completely dry, stick them in the dyer for five minutes if you don’t like that stiff feeling of clothes dried on the line. Water. Turn off the water when brushing your teeth and washing dishes. If you have water running, and no one is using it, you may have a leak that needs to be fixed. Leaking pipes, faucets or toilets can waste a lot of water and will cause a high water bill. Install water-saving shower heads and low-flow faucet aerators. Water heater. On-demand water heaters are a fantastic way to lower your power bill. You should invest in a water softener as well. The hard chemicals in the water could cause calcification, which will harm the on-demand heater. Use a timer for traditional heaters to turn on when you use it the mos and off when you aren’t home. Yard. Water your yard only when needed. The best time is during the coolest part of the day, just as the sun rises and sets. Sprinklers use a lot of water. Set a timer to remind you to turn them off. Place sprinklers in an area that waters the grass and not the sidewalk or pavement. Use large buckets to capture rain water for watering plants. Add mulch around trees and plants to keep moisture from evaporating. Michael Camacho is president and chief executive officer of Personal Finance Center. He has more than 24 years of experience in retail banking and at financial institutions in Guam and Hawaii. 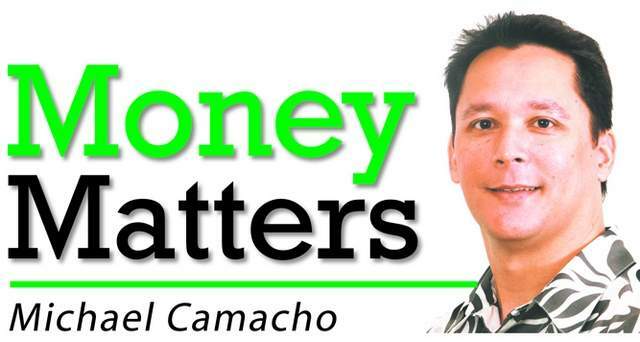 If there is a topic you’d like Michael to cover, please email him at moneymattersguam@yahoo.com and read past columns at the Money Matters blog at http://www.moneymattersguam.wordpress.com. This was originally published on Monday, January 15, 2018, in the Pacific Daily News. Click here to subscribe to the PDN. Question: This year I want to be able to save money, but right now it is difficult and I find myself living paycheck-to-paycheck. I am making my monthly payments on time, but I can’t seem to save or even enjoy the money I do make. Do you have any suggestions to help increase my income? Part-time job. The tried-and-true method of making more money is taking on a second job. You can look for another job or work from home. Part-time jobs add up. Many people are getting creative and selling their skills. A talent that seems ordinary to you might be extraordinary to someone else. Can you speak a second language? Perhaps you can be a tutor or help companies as a translator. Are you good with pets? Many people are looking for someone to watch Fido or Kitty while they are on vacation. Are you a good cook? With today’s hectic schedules people are looking for alternatives to fast food; a personal cook may be a niche that needs filling. Just think, if you cut grass for five of your neighbors for $50 twice a month you will earn $500 a month. That is $6,000 a year! Renting. Do you have an extra bedroom in your house? You may want to consider renting out a room and taking on a roommate. In this economy, many single people are looking for others to help ease the cost of rent and utilities. With the rise in rentals, a roommate could lighten some of that financial stress. You can also rent out your room to visitors. Airbnb has made a few headlines on Guam lately. I was surprised to see how many rooms/houses were available on Guam. If you are interested in turning your home into a rental, be sure you follow the correct procedures and visit the Department of Revenue and Taxation, or you could run into some costly penalties. Skill and worth. Ask your boss how you can be more valuable to your company or organization and what you would need to do to earn a higher wage. Take what your boss says and do it. It may involve gaining additional skills, a degree or certification. The most important asset to a company is human capital. It takes a lot of money to train and hire people. If you can stand out and show incentive to want to make a difference for the company, it may just pay off in the long run. This was originally published on Monday, January 1, 2018, in the Pacific Daily News. Click here to subscribe to the PDN. Michael Camacho is president and chief executive officer of Personal Finance Center. He has more than 20 years of experience in retail banking and at financial institutions in Guam and Hawaii. If there is a topic you’d like Michael to cover, please email him at moneymattersguam@yahoo.com and read past columns at the Money Matters blog at http://www.moneymattersguam.wordpress.com. This was originally published on Monday,January 26, 2015, in the Pacific Daily News. Click here to subscribe to the PDN. When people think of savings, budgets or debt, they automatically get a heavy feeling of despair. They start thinking of drastic ways their everyday life is going to change. Yes, making changes of any kind takes some effort. Change is always uncomfortable but it does not have to be. I have gone online and found a few New Year’s challenges that you can try. • 52-week challenge. This is probably one of the most popular and easiest challenges. There are 52 weeks in a year. At the beginning of each week, deposit the number of dollars that corresponds to that week. For week one, deposit $1; for week two, deposit $2; and so on. By week 52, you would save $1,378! You can deposit the money into a jar or savings account. If you deposit it into a savings account you will earn interest. I have also read that you can start backwards by depositing $52 the first week and $1 the last week. This is beneficial since most of us need that extra money for the holidays. The hardest part is not spending it. • Track your expenses. For 30 days, track every expense you make, even that $5 purchase for gum and a bottle of water. By week two, you will get a better understanding of your spending habits. Because you can literally see where your money is going, you may start to change before the 30 days are over. • Cash Only. This is another 30-day challenge. For 30 days, leave your credit/debit cards at home and only use cash. Having your cards on you makes it easy to stray off your budget and to lose track of how much you spend. By having a limited amount of money, you will make wiser spending choices. After a while, you will get tired of having to run to the bank to make withdrawals. • The morning minute. Take a minute or two before you get started in the morning to view your accounts. Knowing what your balance is at the beginning of the day gives you an idea of how well you are sticking to your budget. Review your spending habits from the past day. Watching your balance get smaller is never fun, but you will think twice before making unnecessary purchases. • Necessity challenge. For a month, pay only for your necessities (food, rent/mortgage, utilities, insurance, etc.). Do not make any other purchases. Do not eat out, buy clothes or go to a movie. This is difficult, but not having these luxury purchases will give you an appreciation for your hard-earned money. • Spare change challenge. At the end of the day, throw your spare change into a jar and watch it grow. At the end of the year, take your spare change to the bank. You will be surprised just how much you saved. If you really want a challenge, add all your spare $1 bills in as well. Try not to dip into the jar. • The de-clutter challenge. Every month, go through your clothes, your children’s clothing and toys, and other parts of the household that you can rid of clutter. Once you have enough items, have a yard sale or go to the flea market. You will not get what you paid for them, but you will earn a little extra cash. Or you can donate them to a thrift store. Ask the thrift store for a tax deductible slip that you can use toward your income taxes in April. There are many more challenges out there. Get creative and find other ways to save. If you really want to add some fun, get your family, co-workers and even neighbors involved. Create an office pool of who can save the most or have a neighborhood yard sale. Challenges are always much more fun when done with others. This was originally published on Monday, January 19, 2015, in the Pacific Daily News. Click here to subscribe to the PDN. When setting financial goals, many of us want to reduce our debt, increase our savings or just break even. That is easier said than done. There are some things, such as the economy, fuel prices or rising utility rates, that are beyond our control. But there are some little things we can control that may help save money. • Earning interest. How much interest a bank offers is something beyond our control, but you can choose to put your savings in a higher interest rate savings account. Shop around. Some FDIC-insured banks will pay higher interest than others. • Hidden Fees. Look at your bank statements. Are there hidden fees you were not aware of? If you are not sure what they are, contact your bank. • Credit cards. Try to use credit cards for emergency uses only, especially those with high interest rates. If you do use your credit card, keep the balance low so that you can pay it off in one or two payments. Keeping your credit card at a high balance accrues interest and affects your credit score. • Credit Score. Check your credit score for free at annualcreditreport.com. Check for mistakes on your report and correct them as soon as possible. A poor credit report can lead to high interest rates or difficulty in getting a loan. • Overdraft protection. Some banks offer a protection plan that lets you over withdraw your account; some up to $500. You usually have to pay a monthly fee for this service. Although it sounds like a good idea, it can create a cycle that will be hard to break. The overdraft protection is really a loan. The next time you deposit money into your account, that money will be used to pay off the loan leaving you short on money that you will need later on. Instead, establish an emergency fund for those unforeseen woes. • Mortgage. Have you reassessed your mortgage rate? Mortgage rates are still a lot lower than they were 10 years ago. If you can refinance your mortgage at a lower rate or shorten your mortgage term you may be able to save a great deal of money. You also can pay a little more every month to help you pay off the mortgage sooner and pay less interest. • Insurance. Most people do not reevaluate their insurance or pay for coverage that they really don’t need. Maybe you had a major life change and have not updated your policy. Take some time to read your policy and understand exactly what you are paying. • Retirement fund. Are you maximizing your retirement fund? One of the biggest concerns is being able to retire with enough money to survive. Even when times are hard, adding a little to your fund will help in the long run. • College. With the rising costs of education, college students should take advantage of financial aid. Many students are getting online degrees or going abroad to lower tuition costs. Avoid creating a large debt that you will be paying for years after you graduate. • Planning for the worse. Do you have a will, advance directive or a power of attorney that will state what your wishes are in case you become incapacitated or pass away? Having these important documents will eliminate a lot of confusion and stress on your loved ones. • Now is the time. Don’t wait till you make more money or get a new job. Getting your financial affairs in order as soon as you can pays off in the long run. A little goes a long way. This was originally published on Monday, December 12, 2015, in the Pacific Daily News. Click here to subscribe to the PDN. There is always a buzz and energy around this time of year. People have made their New Year’s resolutions and are determined to be successful. But how many times have we seen these resolutions forgotten by February? When setting goals, even financial goals, you must be ready to make a change, and your goals have to be realistic. • Be realistic. If you have $20,000 in debt, most likely you cannot pay that off in a year. You may however pay it off in five years. Think how successful you will feel if you paid your debt off in less than five years and imagine how frustrated you will be if you don’t. • Be specific. Getting out of debt is not a specific goal. “I will reduce my student loans by $5,000 in a year” is a specific goal. • Concentrate on one or two goals. Remember quality over quantity. If you create too many goals, you cannot give each goal your full attention and energy. You may become overwhelmed and decide to quit on them all together. • Stay positive. Life has its ups and downs. One month you may need new tires and can’t afford to put $400 toward your goal. Don’t get discouraged. You might be able to catch up on another month. • Celebrate your accomplishments. Don’t wait till next December to celebrate. If you have paid down your debt three months in a row, treat yourself to a little something. • Have a partner. Having someone who is there to be your support is very crucial. It could be a spouse, a relative or a friend. It really helps if you both work on goals together. Sometimes, you need that someone there to be your voice of reason when temptation is knocking. Some people use their friends on social media like Facebook or Twitter to be their support. • Know your patterns. Take a look at what behaviors may hinder your goal. Maybe you are an emotional shopper when you are stressed. Create new behaviors that will set you up for success. Instead of shopping when you are stressed, try something else instead. • Imagine your goal. The tool of visualization is powerful. If you are saving for a car, keep a picture of that car in your wallet or on your computer screen. That way, every time you are tempted to go shopping, you will be reminded of your goal. Come up with reasons why you want to accomplish this goal. Write them down and every time you feel discouraged, read your reasons. • Be ready. Goals only happen when you are ready to make that change. Once you have decided what your financial goals are, you have to change your mindset. The reason for this change is probably because of past practices. Are you prepared to break those habits? • Be flexible. Your goals may evolve and change. You, too, will have to be ready to make those changes. The best tip I can give is that you can’t fail if you are trying. Even if you did not reach your goal of paying off that $5,000 of your student debt in a year, you are still closer than you were at the beginning or the year. The only time you fail is when you don’t try or give up altogether. This was originally published on Monday, January 5, 2015, in the Pacific Daily News. Click here to subscribe to the PDN. Question: My New Year’s resolution is to improve my finances this year, but I just don’t know where to start. I feel overwhelmed and frustrated. Do you have any ideas that can help? Answer: There is a lot to consider when you are planning your personal finances. The new year is always a great time to start making changes. Take advantage of the New Year’s tradition of making resolutions. Many make resolutions to lose weight, stop smoking or to go back to school. Resolutions aren’t only for personal physical changes, but also can be made for your personal finances. After all, resolutions are goals. Before you make any goals, you need to know where you stand. Research your past spending trends and create a budget. A budget is a spending plan that will help you meet your goals. Start by calculating your monthly income. Your income should include your wages, tips, child support, alimony and any other money that you expect to receive. Next, determine your monthly expenses. Expenses are usually broken down into fixed or variable expenses. Fixed expenses are those that do not change and remain the same. Such as rent/mortgage, insurance (car, home, health), loans (student, car, personal) and some utilities. Some of your fixed expenses may be paid bimonthly, quarterly, biannual or even annually. These include income taxes, car registration or real estate taxes. Although you do not pay these monthly, you still need to include them into your monthly budget. Take the yearly total of the expense and divide it by 12. This will be the average monthly expense. Your variable expenses occur regularly but fluctuate month to month. Variable expenses include utilities, food, gas, clothing, entertainment and hobbies. Because they vary, estimate their yearly total from last year and divide it by 12. The more expenses you list, the more accurate your budget will be. Take the total of your expenses and subtract it from your income. The total will either be a surplus or deficit. Does this number accurately portray what you are left with at the end of the month? If it doesn’t, you will need to go back and review your budget until it truly reflects your monthly spending. If there is some money left over, you can use it to pay down debt, contribute it to a retirement or emergency fund, or just simply save it. If your budget breaks even or is negative, review where you can cut back on an expense. It is important to be honest when creating your budget; it is the only way you know where improvement is needed. People are shocked to see that it is the little expenses that add up. Many people have no idea how much they spend on eating out for lunch every day until they multiply the cost of a lunch by five (work days), then multiply that by four (weeks in a month). They then quickly see that it adds up. The same goes for your daily coffee, soda, bottled water or cigarettes. The spending plan you created can also be used to predict different outcomes. Try recalculating your budget by cutting back in areas that really are not needed or increase your income from the raise you are expecting. Use these projected budgets to help you decide what areas you want to improve and what financial goals you want to achieve.